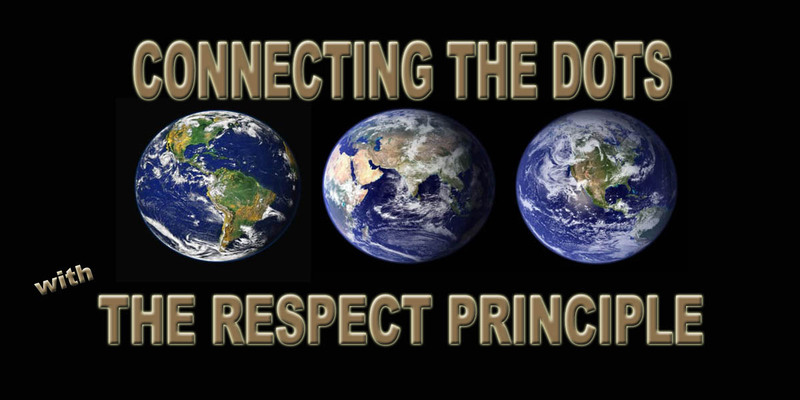 Book 1, “Connecting the Dots … with The Respect Principle” was written for the global literacy level with the intent to share higher education knowledge available in colleges, universities, and the pop culture market with more people since education empowers and to reach into the hearts and minds those broken by disrespectful thinking and actions. Pure in concept with no intention to diminish anyone, I have realized mindsets may consider some parts of the book disrespectful, such as the section on titles, monarchies, and leadership, but that misunderstanding may be a result from the mindset that is not yet global, but local and national. It is also understandable that because of the dominant global mindset that asserts people have to earn respect … have to be worthy in our eyes in order to be treated as valuable has also caused some people to question the validity of the concept. And of course, there are those who cite religious and other beliefs as contrary to the idea that all life is valuable, but that is precisely why the concept of everyone being valuable … worthy of respect is important and valid … because then respect is universal … something every person should be entitled to from birth. To provide a more comprehensive understanding of the “Connecting the Dots … with The Respect Principle” and to address misunderstood or challenges to the concept, books 2 and 3 are in the works … one for the well-educated pop culture audience and the other for children age six. KAITLIN ANN TREPANIER … The Respect Specialist. Humanitarian. Social Entrepreneur. Speaker. Author. Poet. Playwright. Director. Publisher. My company serves as a catalyst to transform “Respect from a value to a principle” as a means to overcome prejudice and its impact, while fostering peace through the creation, publishing, and production of books, products, and services that educate, entertain, and inspire. Currently a sole proprietorship under my own name, the company name will be changing to reflect its goal and purpose in the new year, plus will be transforming into a partnership and a for-profit social enterprise as the best-fit opportunities arise.